Major General Kenneth A. Nava serves as the Adjutant General for the State of New Mexico. As the Adjutant General, he serves as senior military advisor to the Governor and is responsible for providing the State of New Mexico and the United States with a ready force of citizen Airmen and Soldiers. 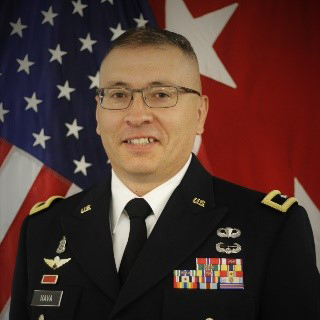 General Nava’s career began in 1988 as an enlisted HAWK firing section mechanic in the 7th Battalion (HAWK), 200th Air Defense Artillery, New Mexico Army National Guard. He later earned his commission as a second lieutenant through Officer Candidate School in 1992. General Nava has held various staff positions at the battalion, brigade and Joint Forces Headquarters levels. He branch transferred from Air Defense to Infantry in 2006 as a result of Force Structure changes in the New Mexico National Guard. He has commanded at battery, battalion and brigade levels. General Nava has deployed and served in operational assignments as Commander, 515th Combat Sustainment Support Battalion, Iraq, June 2008 – July 2010 and as the Operations Officer, 1-200th Air Defense Artillery (Operation Enduring Freedom), Washington, D.C., January 2003 – November 2005.